An opportunity to showcase global startup concepts in Fukuoka. It’s always inspiring to see how many global startups take the time to join Fukuoka’s startup community. This was especially true for the WARAKU SUMMIT, which brought innovators to Fukuoka from Taiwan, Russia, Estonia, and more. As Startup City Fukuoka continually focuses on making global connections to provide new opportunities for local and international startups, events like the WARAKU SUMMIT certainly show the progress being made. On the second day of the WARAKU SUMMIT, I had the chance to sit down and chat with the founders of five exciting startups from around the world. I wanted to wait until they’d had a bit of time to see Fukuoka and get a sense of our startup community. We talked about their projects, their hopes for the future, and their overall inspiration for their startups. Here’s a snippet from each interview. Theodor Belomoev, the founder of 4Blind, is on a mission to solve problems. He’s a professional inventor who identifies a gap, learns all he can about it, and determines a solution. His most recent invention can help assist anyone who is deaf-blind to communicate. 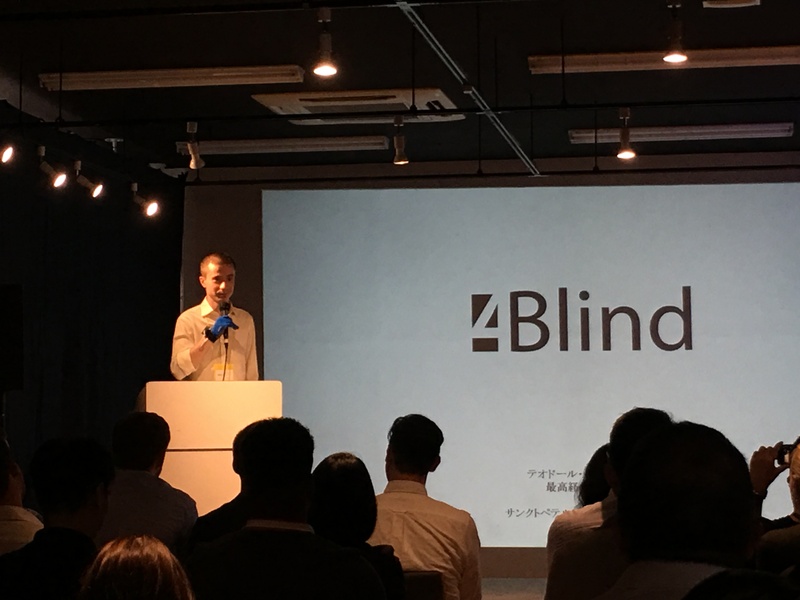 The 4Blind team has developed a responsive glove that allows the user to tap a sensitive touchpad in their palm using Braille and have an app read what they’ve written. Getting to actually try the device was a profound experience. It was easy to learn (with a bit of training required because I don’t know much Braille) and built to be user-friendly. With the high costs of so many assistive devices, another reason this glove is so intriguing is that it will actually be quite affordable. As Theodor was the winner of the Fukuoka Award in the St. Petersburg pitch contest, I’m going to follow his progress and update you as this innovative assistive technology evolves. Check out 4Blind’s details on Matchup here. California-based founder Marquis Morrow shared how the Qrafti app (currently available in the iTunes App store) is a brand new resource for anyone looking to monetize and promote their services. There are so many talented and creative people right in your own neighborhood that can help you with everything from taking photos at your next event to giving you a haircut. The problem is, they’re typically difficult to find and book an appointment with unless you already know where to go. That’s where Qrafti comes into the picture. Anyone with a service to share can enter the marketplace with just a few clicks. By putting their service on the map, Qrafti users can find them and book an appointment or request a service all from the app. Once the transaction is complete, the user rates their experience. Any service providers with a low score are investigated and potentially removed from the platform ensuring that users only see serious professionals on the app. No matter where you are located, you can use Qrafti. Marquis shared that so many people in this gig-centered economy assume they have to drive a car using popular apps to earn extra cash. Qrafti gives everyone the freedom to earn income using skills they actually enjoy. Don’t forget to put your craft on the map today. Check out Qrafti’s details on Matchup here. Mart Salumäe, CEO of Decomer Technology, began to realize he could develop a water-soluble, plant-based material while doing his master’s studies in material science while he was studying bio-polymers. He realized that there was a great opportunity to turn this idea into a real business. With so many options including the food industry, pharmaceuticals, and more, there’s clearly a bright future for the material. It was fantastic to see Mart demonstrate his product during the WARAKU SUMMIT pitches because it really drove his point home. He popped in one of their Honeydrops and continued with the presentation. This was so impactful because it didn’t slow him down at all, the packaging dissolved and he ate the honey without missing a beat. No mess, no chewing. While the honey prototypes use a taste-free version of the material, Mart shared that you can also add a flavoring depending on the application. I’m interested to see what other products Decomer Technology develops using this unique packaging solution. In the meantime, I can’t wait to try the Honeydrops when they hit the Japanese market. Check out Decomer Technology’s details on Matchup here. During COO, William Chien’s pitch, I learned how Embrace Audio Lab had created the smallest immersive surround sound experience with their XROUND device. When he shared how the company had obtained patents in the US, Taiwan, and China I couldn’t wait to hear the speaker in action. He explained how this one, tiny device could completely replace the typical sound system that is frankly expensive and tough to install in most standard apartments. The price point, size, and quality are all big differentiators for this speaker system. What blew me away was the sound quality difference when William gave me an XROUND demo. It’s such a tiny device (I mean shockingly so for the powerful audio it puts out), but it really does give you the surround-sound experience. I listened to it outdoors during the crowded summit, and I still could hear the tiny details that traditional speakers tend to muffle. As he plugged and unplugged the speaker to show the difference between a typical home system and the XROUND, it made a big impact. During our interview, William shared that they’ll be working on developing headphones in the near future, and will begin selling XROUNDs in major Japanese retailers this Spring. Check out Embrace Audio Lab Inc. details on Matchup here. With Japan’s growing elderly population, it’s easy to see how Ilya Skorobogatov and the rest of the team at Laeneco will fit into our market. They’ve developed a small, portable device that provides users with critical medical feedback all in their own home. The purpose isn’t to replace medical care - it’s to encourage people to pay attention and take care of themselves. This electronic stethoscope gives users breathing diagnostics with 99% accuracy in just three minutes. If it alerts the patient to a potential issue, the app also provides doctor’s assistance around the world using a chat feature. By creating a fast and easy-to-understand device for users to understand their breathing, Laeneco has taken a big step toward helping with the early diagnosis of potentially life-threatening lung issues. Ilya explained that this is a wellness device intended to help people be less lazy when it comes to their own health. Often, symptoms go ignored, or people don’t realize they need medical care until it is too late. With Laeneco's stethoscope at home, everyone can now know when it’s time to seek medical help - so there’s no more guessing! The weekend before the WARAKU SUMMIT, I sat down with Brandon Hill, founder of btrax, Inc. to get his take on the current startup climate both in Japan and abroad. Ducking out from his busy schedule to chat about startups, Brandon was very passionate about sharing the possibilities for new businesses in the global marketplace. He explained that after growing up in Japan, moving to San Francisco immediately immersed him in startup culture. It’s ubiquitous there, making it tough not to get involved. After Fukuoka’s Mayor came to see startups in San Francisco and met Brandon, both sides decided that mutual support would be the best path forward. Today, many startups from Fukuoka can participate in events like Asian Night in San Francisco, make use of the company’s coworking space, and perhaps most importantly learn from their expert advisors. While we talked, Brandon also gave me insight into how fast the startup community is growing. He said he sees a significant upswing in high-quality ideas, presentations, and startup proposals. Since btrax advises on both globalizing your business and entering the Japanese market, he’s seen this change first-hand and is impressed by the trajectory. I wanted to end our talk by asking if he had any advice for founders who are looking to expand into the global market and what he told me was incredibly insightful. He said he sees a lot of startup founders that set artificial boundaries in their technology and it limits them. Instead, he recommends that you should go global from day one. Stop living in fear of “what if” and realize that if you change your market size from just one country to global, a whole host of new possibilities suddenly appear. That’s certainly something I think we all should keep in mind as business opportunities come along.